NPR’S MORNING EDITION LIVE AT RISD’S FLEET LIBRARY TODAY! Comments Off on NPR’S MORNING EDITION LIVE AT RISD’S FLEET LIBRARY TODAY! 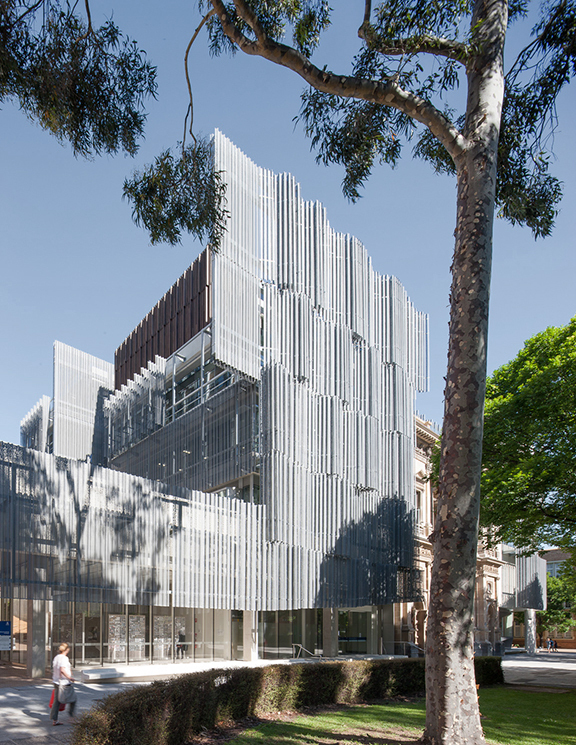 The Melbourne School of Design has received an Education Facilities Design award from the Boston Society of Architects. The award level will be announced in a few months at the BSA’s annual gala. Since 1908 the Northern Avenue Bridge has been heavily used by the Bostons public. Extensive corrosion of the original steel structure created the need for a replacement. The BSA together with the City of Boston and Mayor Walsh recently hosted an ideas competition to explore the future of the beloved bridge. 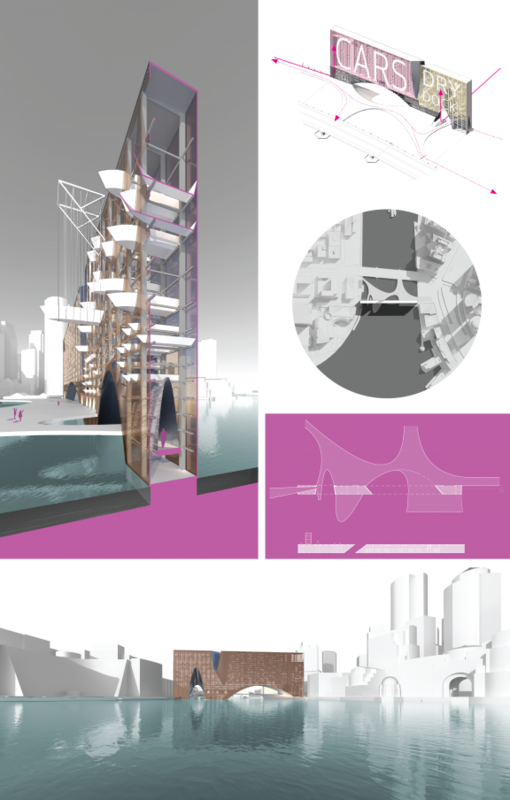 The following is one of two ideas proposed by our office, this one taking the vertical approach. A big thanks to our team Arthur Chang and Nick Safely! A city’s skyline is one of its most precious attributes, it defines an iconography, and figures a recognizable identity in the common imagination. As Boston’s downtown core expands into the seaport district, a gap is forming along the north avenue bridge site as the city grows around it. The Flat Stanley Storage structure leverages a large infrastructural building –housing boats, cars, bikes and basic harbor functions– to produce a continuity of form in the skyline of Boston, and provide mobility and programmatic amenities unique to the site. The project functions as an icon for and a gateway to the expanded downtown, linking the historic business district to South Boston. While much like the children’s book character, the Flat Stanley uses its extreme proportions to accomplish what other, more rotund buildings are incapable of, capitalizes on its eccentricity for the production of a public a pedestrian walkway, and a legible civic figure. Leasable high density parking, boat storage, and rentable bridge level retail provide the capital to fund and sustain the new pedestrian path. 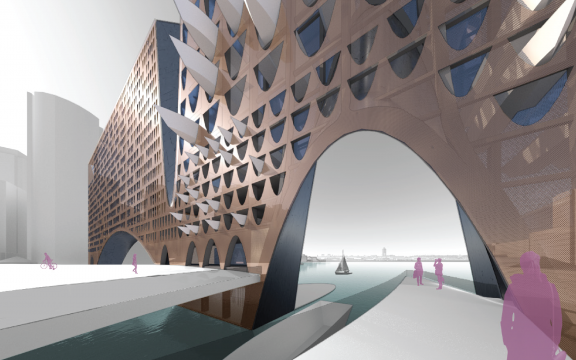 In addition thin film organic photovoltaics cover the ample south facing façade, powering the automatic parking apparatus and providing the development with additional capital when net positive energy is sold to the grid. The Flat Stanley synergizes several much needed infrastructures into a new icon for the skyline of Boston. Since 1908 the Northern Avenue Bridge has been heavily used by the Bostons public. Extensive corrosion of the original steel structure created the need for a replacement. The BSA together with the City of Boston and Mayor Walsh recently hosted an ideas competition to explore the future of the beloved bridge. The following is one of two ideas proposed by our office, this one taking the horizontal approach. A big thanks to our team Arthur Chang and Thomas Tait! Traditionally, bridges have served to connect remote areas, as conduit; here is an opportunity to create a bridge as destination: a new center that connects the historic Boston Downtown with South Boston. We reconnect the Greenway with the Seaport district for pedestrian and bicycle access. It is not merely a path, it is itself a new locus, with open space, and programs for all ages. With variegated green areas catering to different needs, an elevated vantage point that overlooks the harbor, a restaurant and cafe on its lower deck, the New Northern Ave Bridge becomes a place that draws, connects, and projects further into Seaport District. Improving on the original bridge, boats and other water-born vehicles can pass underneath thanks to its generous arching from bank to bank. While the northwest tip of the distorted quadrant touches the Seaport Boulevard Bridge allowing pedestrian crossover, the southeast tip points upwards in an elegant gesture – a peak that once climbed allows an overlook over the waterfront, an urban mountain top everyone will want to scale. The bridge surface shears and creates an opening in its center that extends out into the water in the bay. A cafe and restaurant, right at the water, make for an exclusive location for eating out or getting a drink. A water station serving small boats, kayaks and other small transport vehicles awaits whoever is ready to cut into the water. The bridge surface is divided into 4 distinct areas. An open meadow for frisbee throwers, a playground for children, a bosque around a large weeping willow with seats for reading and a large seating landscape facing downtown for relaxing while looking at the skyline. Don’t miss out on Boston’s Facades+ AM conference coming up on Friday, June 17th at the Omni Parker Hotel. Katie is co-chairing the conference with Ryan Salvas of CW Keller + Associates. The event includes three sessions, with three speakers/session, distilling the best of Facades+ 2-day event into a morning forum. Registration and breakfast begin at 7:30am and opening remarks begin at 8:15am. 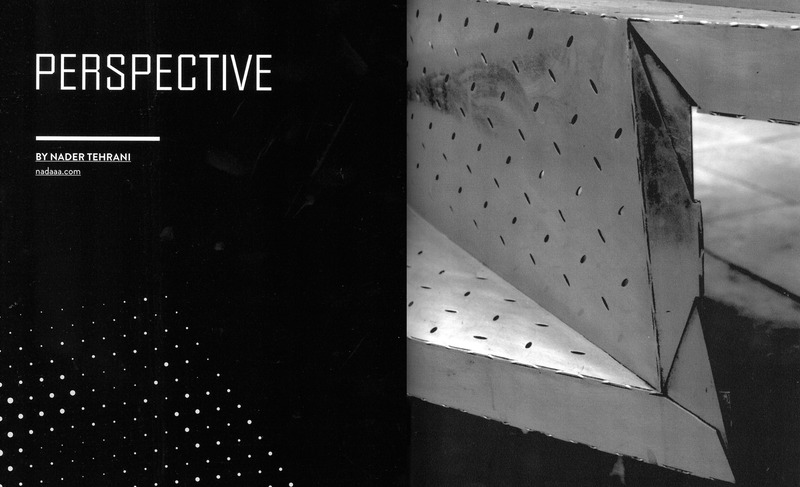 The three sessions are focused on current Boston issues: The Seaport District Reconsidered, Facade and Regional Architecture, and Boston’s High Performance Skyline –which will include a presentation by Nader, Christopher O’Hara and Andrea Love. Also joining the discussions will be Richard Askin, Director of Planning and Design at WS Development, David Carlson of the BRA, Tim Love, David Nagahiro, Mark Pasnik, and Gerrar Gutierrez. Join the dialogue across fields at this unique Boston-centric event. Register now!